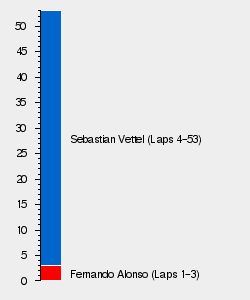 The 2011 Italian Grand Prix (officially LXXXII Gran Premio Santander d'Italia) was race number 13 of the 2011 Formula One Season. It took place at the Autodromo Nazionale Monza on September 11 2011. The race was won by Red Bull-Renault driver Sebastian Vettel with Jenson Button for McLaren-Mercedes in second and Fernando Alonso of Scuderia Ferrari in third.